EXECUTIVE SUMMARY: Pakistan is stepping through a minefield as it concludes agreements on investment, balance of payments support, and delayed payment oil deliveries with Saudi Arabia and the United Arab Emirates worth $13 billion. These deals are likely to spawn growing distrust in its relations with neighboring Iran. Next month, Pakistani PM Imran Khan expects to sign a memorandum of understanding with Saudi Arabia on a framework for $10 billion in Saudi investment, primarily in oil refining, petrochemicals, renewable energy, and mining. The signing is to take place during a planned visit to Pakistan by Saudi Crown Prince Muhammad bin Salman. The memorandum follows the kingdom’s rewarding of Khan for his attendance at a foreign investors summit in Riyadh in October that was shunned by numerous CEOs of Western financial institutions, tech entrepreneurs, and media moguls, as well as senior Western government officials, because of the killing of journalist Jamal Khashoggi on the premises of the Saudi consulate in Istanbul. Khan walked away from the summit with a $3 billion deposit in Pakistan’s central bank as balance of payments support and a promise to defer up to $3 billion in payments for oil imports for a year. The most sensitive investment is likely to be a plan by Saudi national oil company Aramco to build a refinery in the Chinese-backed Baloch port of Gwadar, which is close to Pakistan’s border with Iran and the Indian-backed Iranian 486-hectare port of Chabahar. Both Pakistan and Saudi Arabia are monitoring progress in Chabahar with Argus eyes. Pakistan’s security situation has somewhat improved in the past year, but the country continues to risk blacklisting by the Financial Action Task Force (FATF), an international money laundering and terrorism finance watchdog. It runs this risk because of the Pakistani military’s selective support for militants, as well as the close ties between militants and political parties – including Khan’s own Pakistan Tehreek-e-Insaf (PTI). An additional layer of complexity springs from the fact that funds from the kingdom have been flowing into the coffers of ultra-conservative, anti-Shiite, anti-Iranian Sunni Muslim madrassahs in Balochistan. It is unclear whether the funds originated with the Saudi government or with Saudi nationals of Baloch descent and members of the two million-strong Pakistani diaspora in the kingdom. Saudi Arabia sees the Pakistani region as a potential launching pad for an effort by the kingdom and/or the US to destabilize the Islamic Republic by stirring unrest among its ethnic minorities, including the Baloch. While Saudi Arabia has put the building blocks in place for possible covert action, it has given no indication to date that it intends to act on proposals to support irredentist action. Iran’s Revolutionary Guards were the target of a rare suicide bombing in December in the port city that killed two and wounded 40. Iranian officials, including FM Muhammad Javad Zarif and Revolutionary Guards spokesman Brigadier General Ramadan Sharif, suggested without providing evidence that Saudi Arabia had been complicit in the attack. The attack “underscores the anti-regime sentiment boiling under the surface in provinces such as Sistan and Balochistan and Khuzestan, as well as security vulnerabilities in Chabahar and beyond,” said Brian M. Perkins, a risk management consultant and former US Navy signals intelligence analyst. Khuzestan is an impoverished, oil-rich province in Iran that is home to that country’s ethnic Arab community. 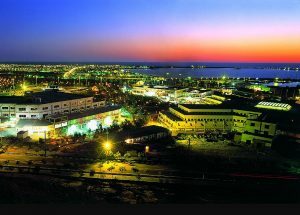 Chabahar is located in the Iranian province of Sistan, and Balochistan boasts the country’s highest unemployment rate. Saudi thinking about stoking unrest coincides with that of President Donald Trump’s national security advisor John Bolton, who, before assuming office, publicly advocated the destabilization of Iran. Bolton was referring to harsh US sanctions imposed after Trump last year withdrew the US from a 2015 international agreement that curbed Iran’s nuclear program. Desperately in need of financial support and investment, Pakistan’s agreements with Saudi Arabia and the UAE come at a moment when “Pakistan-Iran relations are at a crossroads,” according to Muhammad Akbar Notezai, the Dawn newspaper’s plugged-in Balochistan correspondent. This is a far cry from four years ago, when the Pakistani parliament refused a Saudi request that Pakistani troops join the kingdom’s ill-fated military intervention in Yemen. Iran now sees Pakistan as a Saudi ally in the kingdom’s rivalry with Iran. Similarly, Pakistan fears that Chabahar will allow India to bypass Pakistan in forging closer economic and political ties with Iran as well as with Afghanistan and Central Asian nations. Pakistani analysts expect an estimated $5 billion in Afghan trade to flow through Chabahar now that India has started handling the port’s operations, a transition that occurred last month. Pakistan is also worried that deteriorating Pakistani-Iranian relations offer India an opportunity to subvert the $45 billion-plus China Pakistan Economic Corridor (CPEC), a crown jewel of the People’s Republic’s Belt and Road Initiative.